Todd Reichert pedals three metres into the air during flight testing of the first successful human-powered helicopter. Photo by Martin Turner, Visiblize.com. Until last month, some experts in aeronautics would have told you that running a helicopter on human muscle power was more or less impossible. Luckily, Cameron Robertson and Todd Reichert didn’t listen to them. 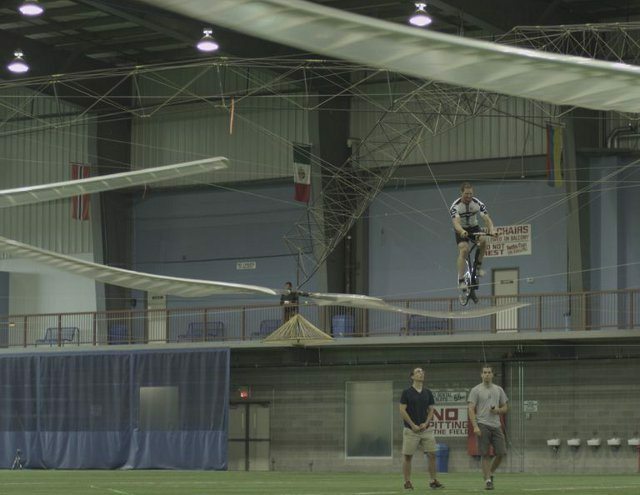 In June, their experimental helicopter, known as Atlas, rose from the artificial turf of the Ontario Soccer Centre in Vaughan and stayed aloft for more than a minute. Driven by nothing more than Reichert’s considerable athletic ability, the quad-rotor craft reached a maximum height of over three metres while remaining within a square only 10 metres along each side. By meeting those key criteria, Robertson and Reichert’s team became the first to win the Sikorsky Prize, a $250,000 challenge that had gone unclaimed since it was first introduced by the American Helicopter Society (AHS) 33 years ago. The age-old dream of human-powered flight first became a reality in the late 1970s, when American aeronautical engineer Paul MacCready designed the pedal-powered airplanes known as the Gossamer Condor and the Gossamer Albatross. The latter of these flew across the English Channel in 1979, and prompted the AHS to create a $10,000 prize for the first human-powered helicopter the following year. But designing helicopters is a lot tougher than making fixed-wing aircraft. “In an airplane, you’re flying forward into fresh, undisturbed air,” says Robertson. “In a helicopter, you’re staying in the same place.” This means that you’re trying to push down a column of air that is already in downward motion. The resulting drag requires more power, and a rough calculation shows that the amount needed to lift an ordinary human is discouragingly close to the upper limits of what that human might reasonably be expected to produce. Since 1980, at least five human-powered helicopters have managed to lift off the ground, but until recently none had made it any higher than a few inches. In 2006, Reichert and Robertson met as graduate students in James DeLaurier’s lab at the University of Toronto Institute for Aerospace Studies. They quickly learned that they shared a passion for human-powered flight, and by 2009 they had built the world’s first human-powered ornithopter: a machine that flies by flapping its wings like a bird. “We didn’t have much research funding, so we did a lot of the fundraising ourselves,” says Robertson, noting that the same method of scraping money together would come into play when the time came to build Atlas. The ornithopter, called the Snowbird, needed to be towed behind a car in order to get up to speed, but once airborne it could fly for several seconds powered only by Reichert’s operation of a rowing-like mechanism. Meanwhile, the Sikorsky Aircraft Corporation pledged enough money to increase the value of the Sikorsky prize to $250,000. In 2011, fresh from their success with Snowbird, Reichert and Robertson saw a video of a team from the University of Maryland, who were testing a human-powered helicopter called Gamera I. “We decided that this would be a great way to sink our teeth into something that we love doing,” says Robertson. The two engineers began tossing around ideas, and by early 2012 they were creating computer models of what the aircraft might look like. Because other teams already had a head start, Reichert and Robertson needed to employ novel techniques. For example, traditional engineers might use one computer model to design the ideal wing shape, then cross-check it against a separate model that tests whether a given structure will stand up to the stresses of flight, a process that has to be iterated dozens of times. By contrast, Robertson and Reichert created a single model that integrated both aerodynamic and structural components. “Basically, you can press go, and in two minutes design the perfect helicopter,” says Robertson. The process reduced the time required to design Atlas to only a few months. In the summer of 2012, Robertson and Reichert recruited a team of undergraduate students to help them with the project. Many came from the University of Toronto’s human-powered vehicle design team, a student organization that normally focuses on ultra-fast bicycles. Others came from the University of Ottawa and the University of Waterloo. “It was just the most fantastic group of driven, motivated students that we’ve ever had the pleasure to work with,” says Robertson. In addition to finalizing the detailed engineering design, the team helped with fundraising and securing in-kind donations of material, such as the world’s lightest production bike frame, which was donated by Cervelo Cycles. By December, Reichert and Robertson had incorporated a company called AeroVelo to manage the project, and were well into a regime of flight testing and experimental studies. Like the Gamera I and many other human-powered helicopters, the Atlas uses a four-rotor design. The main reason for this has to do with a concept called torque balance. Essentially, spinning a rotor in one direction creates a force called reaction torque, which will spin the body of the helicopter in the opposite direction in accordance with Newton’s third law of motion (every action creates an equal and opposite reaction). Traditional helicopters use a second rotor on the tail to keep the body of the craft pointed forward, but this approach wastes a lot of energy. “In our case, we have two rotors spinning clockwise and two spinning counter-clockwise, so the torques cancel out,” says Robertson. The other advantage of the symmetrical configuration is that it simplifies manufacturing: once each component was designed, it was relatively easy to create four or eight identical copies. In terms of materials, only the strongest and lightest would do. The spars that form most of the main structure were painstakingly handmade from carbon-fibre tubes, while the lines under tension are high-performance polymers like Kevlar and Vectran. The blades of the rotor have ribs made of polystyrene foam core and balsa wood and are wrapped in a “skin” made from a specialized polyester film called Melinex, which provides the smooth, aerodynamic surface needed to generate lift. From one point of view, Atlas is huge: at 13,700 square feet, it’s the second-largest helicopter ever built. On the other hand, it weighs only 122 pounds. Reichert, the pilot, weighs 165.